Step 2: Connect to the Internet. In order to complete the Setup Wizard, your Blackphone will need to access the Internet. You can use mobile data for this, but we recommend connecting to a Wi-Fi network for a faster, more reliable connection while your device checks for updates and completes setup. Important Note: You cannot connect to a WPA-enterprise network (PEAP, TTLS, etc) during the setup wizard. To connect to a WPA enterprise network, wait until you have completed the setup wizard. 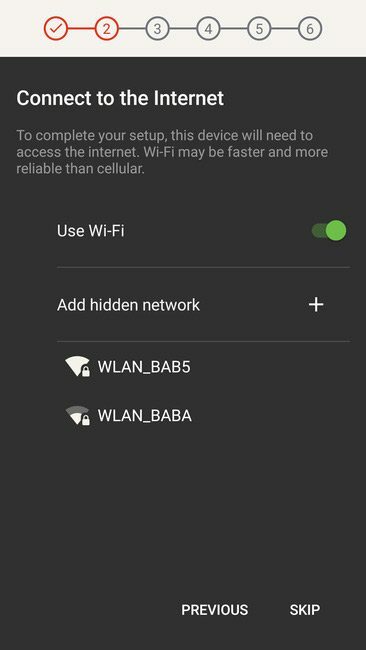 To connect to a Wi-Fi network, either select one from the list, or tap “Add hidden network” to add a network with a hidden SSID. Enter the network details and tap Connect. Blackphone 2 includes dual-band W-Fi support to connect to 2.5GHz or 5GHz networks. If you don’t want to connect to a Wi-Fi network and want to complete setup using mobile data, tap Skip.